Every week this summer, we'll be taking an historical tour of the Hollywood blockbuster by examining an older film that is in some way a spiritual precursor to one of the weekend's wide releases. This week: Roland Emmerich's latest "violating the White House" picture, White House Down hinges on a wannabe Secret Service agent protecting the President. Men of his profession are rarer than other breeds of supercop in the movies, but not totally unknown. Broadly speaking, there are two phases to Clint Eastwood's career as an actor (as differentiated from his career as a director, which is far more complex and interesting): the ones where he was a tough-guy action hero, and the ones where he was a worn-out old man painfully aware that he was no longer a tough-guy action hero; the macho films, that is, and the subversion of the macho films. 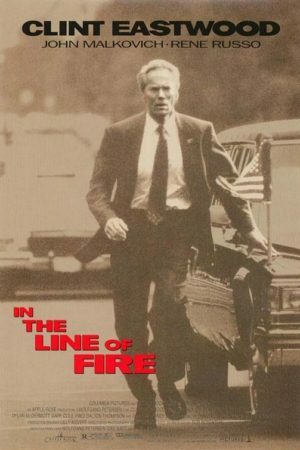 There's really only one film where these two faces of Clint overlap, 1993's In the Line of Fire, in which the 62-year-old actor, playing a character at least a few years younger (in fact, Eastwood initially refused to sign up for the movie on those exact grounds), is still able to run and jump and shoot guns with the best of them, but is plagued with the doubts and aching memories of an old man. Perhaps coincidentally, perhaps not, it was the last Eastwood performance given for any director other than himself for almost two full decades, until 2012's Trouble with the Curve rather oddly put him back in the game; the film was made by Wolfgang Petersen, a German director who knew from mixing action with psychological investigation of men in distress. His was the legendary Das Boot, a film incontestably greater and more intellectually rich than our present subject, though ItLoF is probably the most rewarding of Petersen's American films; it was not his first, but it did kick off a solid decade of him crafting better-than-average action pictures with just enough character depth that it's not embarrassing to watch them. In this case, the primary character with depth is Frank Horrigan (Eastwood), a Secret Service agent who used to be the Treasury Department's hottest young Turk when he was John Kennedy's favorite bodyguard, and who has been haunted for three decades by his failure to save that president's life in Dallas, and now spends his lonely days off drinking and playing piano. So, "depth" should be understood as a relative quality, not an absolute one. But as far as stock histories for thriller protagonists go, the "grizzled warrior tormented by his one great failure" archetype is a noble one, though speaking entirely from a matter of taste, I don't know if using the real-life death of JFK as the motivating element in a genre character's backstory is something that the film earns, or even realises that it has to earn. Frank has, in later years, moved away from president-guarding duty, and when we first meet up with him is busting a counterfeiting ring with his young partner Al D'Andrea (Dylan McDermott). And it is in this pasture that his career would peter out, except that he is pulled into a most villainous plot: there's a madman who has laid bait for the Secret Service, promising to kill the president and looking far more likely to do it than any of the thousand-odd crackpots who make similar threats ever year. And the one piece of evidence he leaves for the T-Men is a photograph of a much younger Frank standing with Kennedy on the very day of the assassination. And this same madman, played by John Malkovich, places a call to Frank that convinces the agent to get back on the President's detail as soon as possible. There, really, is your movie: a smart but old and out-of-practice Secret Service agent squaring off against a cryptic enemy who knows every last tiny thing about him, and sees this as one big game, a chess match with the life of the President as the stakes. And this is also something that we've seen a lot of, just as much in '93 as in '13, and there is little attempt by ItLoF to dodge every last cliché of the genre it can scrape up, though scenes of techies breathlessly waving on the protagonist to keep the killer talking while they trace his phone weren't quite as ludicrously over-done 20 years ago as they have since become. While the film has always been understood to be an action picture, one of the more notable things about it is how very little true action there is as most of us understand that phrase. One thoroughly exciting foot chase, one climactic struggle in a precarious elevator, and the rest is almost exclusively procedural elements mixed with a very light patina of psychological struggle - every inch a thriller, but grounded more in brainwork than fighting. This is to the film's clear benefit, not because the psychology being explored is especially probing and incisive - for it very plainly is not - but because the film's cast is generally of exactly the right mettle to give the characters heft and personality that Jeff Maguire's long-in-development script does not possess, and almost certainly could not possess without fiercely imbalancing things. Eastwood, never the most versatile and flexible actor in the best of circumstances, is certainly great within the very particular limitations that he's largely been content to stay within, playing an irascible, weary emblem of American masculinity, and with ItLoF acting explicitly on a treatise of exactly that (the film's themes, when they start to come to the fore, hinge entirely on the feeling of generational loss as post-war optimism turned to modernist dread in the moment that Kennedy died, the foundational myth of the older cohort of Baby Boomers - there's a priceless moment in which Frank angrily derides the romance of Kennedy assassination conspiracies, most recently given oxygen by the two-year-old JFK), Eastwood is about as perfect a vessel as 1993 was going to provide, though he doesn't fit all of the part's specific needs. In particular, Frank's romance with a pretty, younger Secret Service agent, Lilly Raines (Rene Russo, right at the onset of her brief but intense brush with stardom) falters both because of how unpleasantly old Eastwood is compared to Russo, and because the actors have absolutely not the smallest trace of chemistry (it being a curiously persistent trait of Eastwood's acting career that he rarely ever has a real spark with his leading ladies). Given that the Lilly plot is almost explicitly supposed to humanise and ground Frank, compared to his antagonist, this failure to stick the landing hurts the film, though not to distraction. Anyway for all that Frank is the protagonist and an excellent, if reductive and, by 1993, old-fashioned role for Eastwood, ItLoF triumphs entirely on the strength of its villain. We are endlessly fascinated with killers, and Petersen cedes all of the movie he can spare to Malkovich, whose dazzlingly self-analyzing psychopath is an unmitigated triumph of action-thriller villainy, good enough to break through the genre resistance of the Academy of Motion Picture Arts and Sciences, who nominated the actor for an Oscar (as well as the editing by the great Anne V. Coates and, even more surprisingly than Malkovich, Maguire's script), in one of the weirder years for the Best Supporting Actor category on the books. Any consideration of how the movie works has to center on Malkovich; if Eastwood gives the film an anchor, Malkovich single-handedly gives it genuine stakes, doing more to sell the film's arguments about emotional damage and loss of innocence and value than any other single element, and being endlessly creepy at the same time. The movie, as a whole, entertains; it is Malkovich who captivates, and turns a solid procedural into a genuine genre classic. Without him, I frankly don't know how much I'd like the movie. It's solid all-around; Petersen's chief strength in this movie (which is not his chief strength elsewhere, though it's one of the things that distinguished him from other, similar directors at the same time) is mostly a matter of foregrounding character over events, and this gives ItLoF some measure of gravity and respectability, but it doesn't make it the most exciting movie that could be made on this scenario, and the director is unexpectedly restrained in his stylistic gestures, with the only outright showy moment being a series of dissolves that show how the villain disguises himself as more of a natural chameleon than an actor or con artist. Frankly, it's a sedate movie, which sharpens the edge of the few moments of out-and-out action, but it also gives the movie a certain languid pace that it's really not smart and deep enough to earn; 128 minutes is, at any rate, a lot of time to spend with a movie whose conflict is as basic and whose sociological observations are as callow as they are here. And yet, it works: that is the most important thing, of course. It's nothing timeless, but it's certainly one of the more rugged and enjoyable examples of how early-'90s mainstream cinema worked when it was being made sensibly and effectively, without claiming to be anything special. There's certainly not much to it that's particularly revelatory, but it is thoroughly satisfying in most of the ways that matter. You forget how extraordinarily gratifying this kind of well-mounted entertainment for something like an adult audience could be until you realise just how long it's been since they were making it consistently.